Phoenix Chinese Cultural Center's roof was made by the "XiangShang Bang" craft masters, whom inherited the same technique and materials that were use in the Forbidden City, designed and built by their ancestors. President Trump visited China in November of 2017 and admired the Forbidden City's 600 years old roof. 668 North LLC called the 20 years old roof in Chinese Cultural Center as aging roof, and fought in the court to replace all of the roof with residential adobe tile for this commercial building. Their action shows either an ignorance or hostile attitude towards Chinese heritage and culture. Thank you for joining us to stop them. 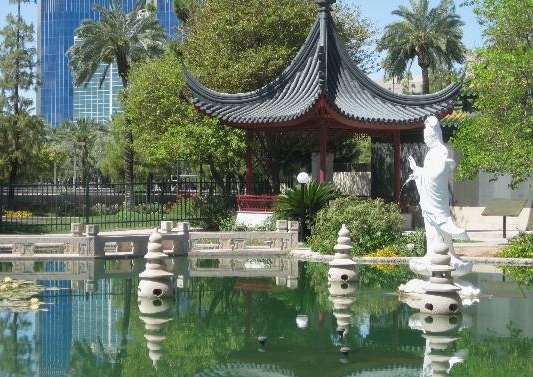 The Phoenix Chinese Cultural Center, also known as the COFCO center, was built by the first owner with help from community volunteers and donations from local Chinese immigrants with support from the City of Phoenix government. Special materials and supplies were brought from China, and skilled workers from China spent years making this one of the most beautiful Chinese Cultural Centers in North America. The names of donors are engraved in the Wall of Honor, and it has become a Phoenix landmark, and part of Arizona's history. 668 North LLC, a subsidiary of Scottsdale-based True North Companies, bought 95% of the condo units in June 2017. Szechwan Palace Restaurant owns another 5% of the units since December 1998. While totally ignoring the property rights of other owner, 668 North LLC is planning to remove all features connected with Chinese culture and history from the exterior of the buildings in the common area to create standard "modern" office buildings. While they have recognized the historical importance of the Center and has offered the garden artifacts that will be removed, we want to save the Chinese Cultural Center as a whole. It would be impossible to fully disassemble and restore the center's heritage at another location. Please donate now to support our fight to save the Chinese Cultural Center, and save Arizona history!